If you thought the America’s Cup was just about challenging for the Auld Mug, think again. The America’s Cup organisers have released the superyacht programme for the 2017 Cup in Bermuda with bountiful options for a VIP experience at the Cup. As laid out in the The America’s Cup presented by Louis Vuitton 2017 America’s Cup Superyacht Program, beyond the Cup itself there will be a Superyacht Regatta, exclusive parties, VIP access to Club AC, personalised superyacht concierge assistance, and numerous berthing options available for superyachts. And as for watching the Louis Vuitton America’s Cup races and America’s Cup finals? “Superyachts will be offered exclusive ringside seats to see the speed and skill of the world’s best sailors throw their boats at each other at speeds over 40 knots,” says Regatta Director Iain Murray. Buy a VIP package that gets your yacht the right flag, and gain access to the front row of the electronically defined racecourse for the best view of the racing action. The Louis Vuitton America’s Cup Qualifiers will begin on May 26, 2017 and run until June 5 with a few lay days in between, while the Challenger Playoffs begin on June 7 and wrap up with finals on June 11 (and June 12 if necessary). Before the America’s Cup Match begins, there will be a chance for superyachts to get in on the thrill of racing in Bermuda as an America’s Cup Superyacht Regatta is hosted on June 13 and 14, with racing taking place either inside the Great Sound or on an ocean course, weather dependent. 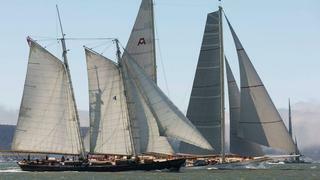 As part of the America’s Cup Superyacht Regatta, there will be an Owners’ Dinner and End of Regatta Party. Then on June 15, 16 and 19, J Class yachts make a triumphant return to the America’s Cup with the much-anticipated J Class regatta. The America’s Cup Match presented by Louis Vuitton kicks off on Saturday June 17 with two races each day that weekend. Unusually, the Challenger will have a full five days to prepare and make any tweaks before facing off against Defender Oracle Team USA in the final set of races on June 24 and 25. Additional race days are allotted for June 26-27, which could be needed if racing is cancelled or rescheduled as was seen in San Francisco during the last Cup. In between the two America’s Cup Match weekends, the future of racing will square off in the Red Bull Youth America’s Cup Finals, presenting another opportunity for superyachts to watch fierce and fun racing action in the Great Sound. Superyacht berths are available at a number of marinas and protected breakwaters around Bermuda from May 20 to June 30, ranging from $10 to $15 per foot, per night.